Dnister Hotel is situated in historic centre of Lviv and surrounded by the picturesque old park. Rooms and suites feature a breathtaking panorama of Old Town that is listed in UNESCO World Heritage. Dnister is a hotel in Lviv that combines traditional hospitality and individual attention to each guest with high service standards of Premier Hotels collection. We offer 150 rooms, among them 12 suites, 22 Business, 33 Superior, 50 Standard and 33 Economy rooms. All rooms are air-conditioned and equipped with direct international telephone and satellite TV. Superior and Business rooms, as well as Suites are equipped with minibars, hair-dryers, bathrobes and slippers. Extra benefits of our Business rooms are Wi-Fi Internet access and tea& coffee making facilities that are included in the room rate. The 21m² Standard room has two single beds and all amenities necessary for work and rest. Please note, that an additional government tourist tax of 1% of net room rate will be added to the final bill. Check with hotel for details. Please note, that an additional government tourist tax of 1% of net room rate will be added to the final bill. Check with hotel for details. 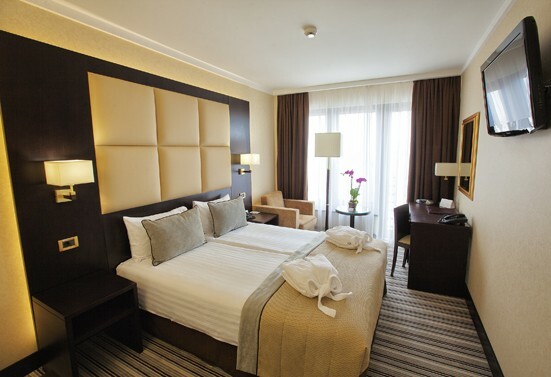 Recently renovated and refurbished Premier rooms are decorated in a European style. Comfortable British and Italian furniture, elegant pastel colours and modern amenities create an atmosphere of peace and comfort. By choosing a 21 m² Premier room (maximum capacity 2 persons), each guest can count on a comfortable and relaxed stay. Each spacious 60m² Suite consists of two rooms: a living room and a bedroom, plus two bathrooms. The maximum capacity is four persons. The Suite has a beautiful view of the Old City and Ivan Franko Park. Suite category rooms also feature balconies. Italian furniture, modern design and amenities are sure to make your stay pleasant and comfortable. Please note, that an additional government tourist tax of 1% of net room rate will be added to the final bill. Check with hotel for details. Bar Panorama. The main features of our popular Bar Panorama located on upper level of the hotel is the best view to the Old Town and High Castle Hill together with the specialty of the house - delicate Lviv style pastry. BAR ON THE 2ND FLOOR. Located on the 2nd floor, this 24-hours bar is the best place to relax after a busy day. Extensive bar menu, light snacks, free WiFi Internet and two billiard tables. Here you will enjoy both delicious food and charming view to the ancient park located right opposite the hotel. Perfect place for business meetings or informal dinner. ​Conference Hall. Dnister is a perfect venue for all types of you events. Whether you plan a business meeting or a seminar, a conference or a presentation. The hotel has conference and banqueting facilities. SPA and Sport Health and body treatment at Dnister Premier Hotel sauna. Want to have amazing and stunning looks? Visit Aventin Beauty Parlour on the 1st floor of Dnister Premier Hotel.